CHEF of Alabama received an email with the information about a homeschool geography bee. We are grateful to Shades Mountain Independent Church Academy for sponsoring this opportunity for homeschoolers. The registration form says "Jefferson County." But the e-mail I received said Central Alabama. I am going to distribute this e-mail widely, so you can interpret "Central Alabama" in any way you want. If you could let your families know about this opportunity, they can choose to drive to Birmingham to participate, or not! If you know of a homeschool opportunity in your area like this, and would like me to publicize it as well, please let me know, and I will. THANKS so much for your help in getting out the word about this. 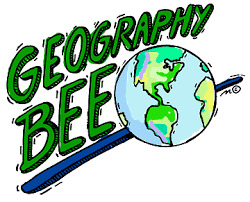 These 10 daily questions are the types of questions your children will encounter in the local level Geo Bee. If you would like to register, please fill out the registration form below, attach your check and mail to the address given.